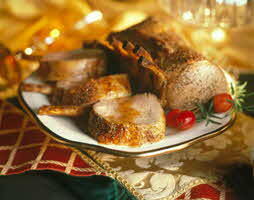 Trim excess fat from pork loin and trim extra meat from between rib bones. This is called “Frenching” the bones; you can also ask your butcher to do this). Place pork roast, bones up, on rack in shallow roasting pan. Roast for 1- 1½ hours, until meat thermometer inserted reads 150-155 degrees F.
Remove roast from oven, let rest about 10 minutes. This elegant, but infinitely easy, roast is the perfect centerpiece for a dinner party. Try roasting it on a covered grill, too. Serve with a French potato salad (dressed with vinaigrette), buttered green beans with dill, pickled beets, and a loaf of French bread.